All 14 operations flown by Navigator Stoney Mitchell and Bomb Aimer Merv Bertie from 16 November 1944 through 12 March 1945 were in Lancaster bombers, the 4-engine workhorse of Bomber Command from 1942 onwards. With Gaven Henry as their Pilot, the first 13 ops were in 10 different Lancasters (see 13 Ops). Mitchell and Bertie’s 14th and final op on 12 March 1945, piloted by Stan Slater, was in Lancaster ME449. Lancaster ME449 was shot down over Denmark on its 17th operational flight at 2145 h on 12 March 1945 with the loss of two lives, Mid-Upper Gunner Harvey Porter and Rear Gunner Donald Morris (see Englændergraven). Lancaster ME449 was the 8th Lancaster at 103 Squadron Elsham Wolds to receive the identity PM-T.
Each Lancaster bomber had a unique serial number, typically of five characters, two letters of the Roman alphabet followed by three numerals. The Lancaster with the serial number ME449 was a Mark I with Merlin 22 engines built by A. V. Roe and Company at Yeadon, Yorkshire, and delivered to 103 Squadron at Elsham Wolds, Lincolnshire, on 23 January 1945. It received the individual identity of PM-T and was the eighth Lancaster so coded with 103 Squadron. From 28 January to 11 March 1945, ME449 returned from 16 sorties for a total of 111.6 hours of flying time, mostly piloted by RCAF Flying Officer J. A. Laviolette with his crew of three RCAF and three RAF airmen. On 12 March 1945, Laviolette and his crew flew Lancaster NG491 on the daytime “thousand bomber” raid to Dortmund while ME449 was serviced and loaded for a night-time mining operation. On its final sortie on the evening of 12 March, Lancaster bomber ME449 was piloted by RAF Squadron Leader Stan Slater from 576 Sqdn, also stationed at Elsham Wolds. After 4 hours of flying, ME449 was nearing the west coast of Jutland on the return journey from minelaying in Kullen Sound at the northern mouth of the Øresund between Denmark and Sweden (see 12 March 1945). ME449 was then attacked at 2145 h by Junkers nightfighter Ju88 D5 + AL piloted by Hauptmann Eduard Schröder from Staffel 3 of I./NJG 3 based at Fliegerhorst Grove near Karup in Jutland. The aircraft belly landed in a farmer’s field south of Tarm, Denmark, and broke into three pieces. Five of the crew baled out before the crash, but the two gunners were found in the tail section by members of the local Civilbeskyttelse (CB) and their bodies were taken to the hospital in Tarm (see Eye Witnesses, Englændergraven, In Memoriam). After the loss of his “usual” Lancaster ME449 on the night of 12 March, Laviolette and his crew flew 8 more ops for a career total of 32 sorties (one as 2nd pilot, one aborted, and 30 completed); see Laviolette’s RCAF Career for details. Laviolette’s final five flights from 22 April through 2 May 1945 were in Lancaster PA319, also coded PM-T, giving him a total of 18 sorties on bombers with the individual identity T (13 with ME449 and 5 with PA319). 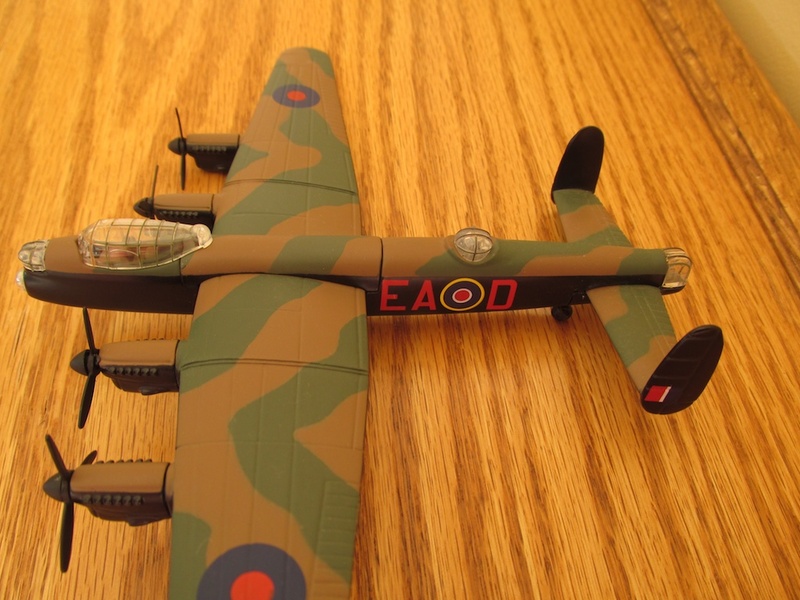 In addition to a factory serial number, each RAF Lancaster bomber was also given a readily visible individual identity. This identification typically consisted of three characters (usually three letters from the Roman alphabet), with the first two denoting the squadron to which the aircraft was attached and the third letter specifying the individual aeroplane within that squadron. The three-character identity was painted behind the mainplane on each side of the fuselage, within the black immediately below the camouflage-coloured topside. An RAF roundel outlined in yellow was positioned between the two-character squadron designation and the single-letter individual identification. Example on a model Lancaster of a three-character individual identity. The letters EA denote all Lancasters with 49 Squadron and the letter D identifies the individual Lancaster. Navigator Stoney Mitchell and Bomb Aimer Mervyn Bertie flew with 103 Squadron based at Elsham Wolds, Lincolnshire. Lancasters with 103 Squadron were denoted with the squadron identification PM. Because of the high attrition rate of bombers throughout the war, letter codes were re-used following an aircraft’s loss. By war’s end, nine Lancasters had been given the individual identity PM-T. Of these nine Lancasters, seven were lost on operations, one served only a brief period with 103 Squadron, and one was still in service at war’s end. * Date of loss is recorded as the date on which the aircraft was expected to return to base. LM243 was lost on a day-time operation bombing V-2 storage sites in France, ME449 was lost on a night-time mining operation with an expected return time before midnight, and the other five planes that failed to return were lost on night-time operations straddling midnight. Gaven Henry’s crew had flown on the sixth of the above PM-T Lancasters, NF999, on two occasions, both of which became memorable because they involved time at bases other than Elsham Wolds. The first occasion arose when when returning from minelaying with Lancaster NN766 on 21/22 December 1944. An engine problem forced a diversion to East Fortune, Scotland, after which the crew returned to Elsham Wolds on NF999 on 23 December. The second occasion occurred the next day, Christmas eve. Henry’s crew was assigned NF999 for a bombing operation to Cologne. Bad weather in Lincolnshire forced the returning plane to divert to a USAAF base at Old Buckenham, Norfolk, with the consequence that the crew missed spending Christmas with their squadron. Continuing cold and fog further delayed their return to Elsham Wolds; eventually the crew was transported to home base by truck on 30 December 1944. In December 1944, Gaven Henry’s crew flew one non-operational flight and one operational flight on Lancaster NF999 with the identity PM-T. Original document in Gail Michener’s personal collection. 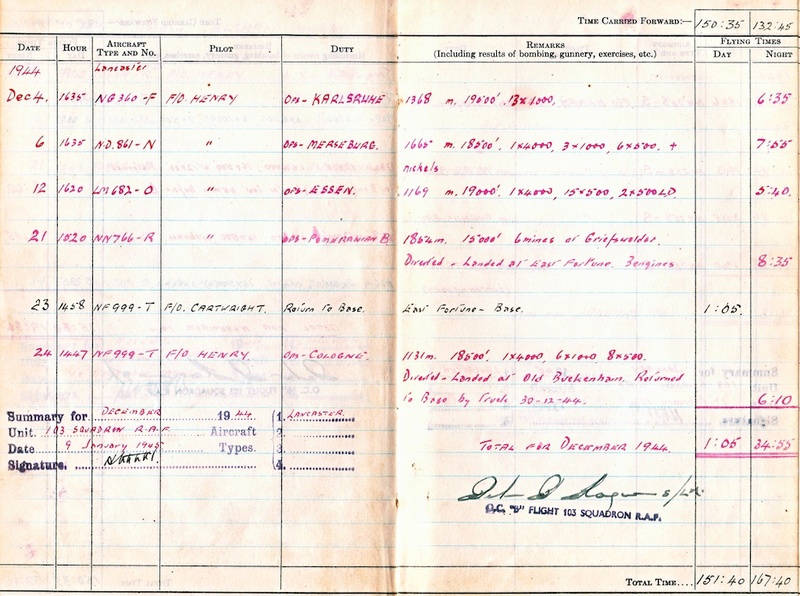 Stoney Mitchell’s experiences with NF999 is of significance in his evasion story because it led to an error when he filled out his Navigator’s log book on his return to England from Denmark and Sweden. Stoney identified the aircraft in which he was shot down on 12 March 1945 as NF999 – T. Having remembered its individual identification letter, he assumed it was the same T on which he had flown in December. However, NF999 had been lost on operations in early January 1945. 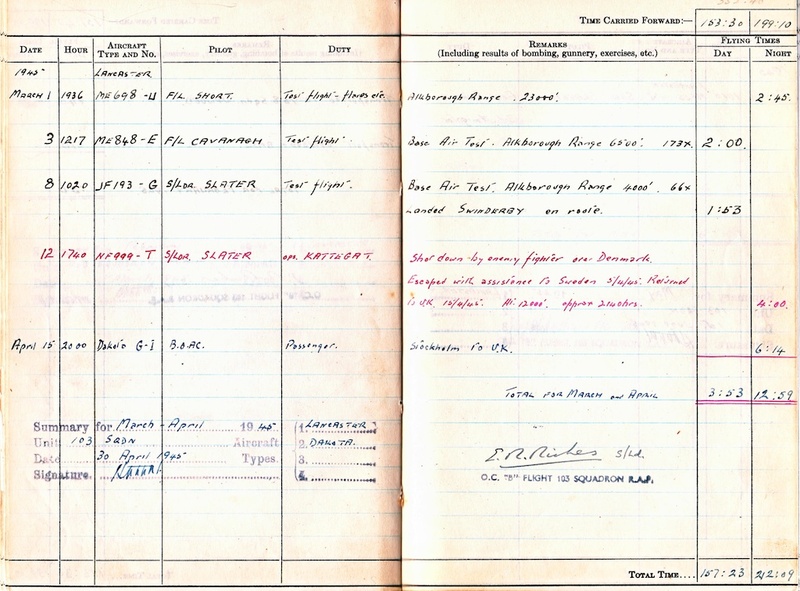 Stoney Mitchell’s entry for the aircraft flown on 12 March 1945 should be ME449 – T not NF999 – T.
After the loss of NF999 on operations in early January 1945, the designation PM-T was briefly reassigned to a new Lancaster with the serial number PB898. That bomber flew only two operations before it ended service with 103 Squadron, possibly on being transferred to a Conversion Unit. The next Lancaster to receive the identification PM-T was ME449, which flew 16 operations with 103 Squadron from 28 January through 11 March 1945, and then flew its final flight on a mine-laying operation the next day, 12 March 1945. Subsequently, a ninth Lancaster, PA319, was given the identity PM-T. It survived to the end of the war and was eventually scrapped in 1947. For clarity of spoken communication and to avoid the confusion of similar sounding letters such as F and S or P and T, British forces used a radiotelephony spelling alphabet in which each letter of the alphabet was assigned a word. In World War I, T for Tommy was used by both the Royal Navy and British Army, the forces from which the Royal Air Force arose through the merger of the Royal Naval Air Service and the Royal Flying Corps. Post-WWI all three forces switched to T for Toc through 1942, then switched to T for Tare from 1943 to 1956. Because Tare is pronounced the same as tear (as in a rent in the fabric, not as in droplets from crying), some post-war articles (e.g., Australian newspaper Orange News Pictorial on 31 March 1971) incorrectly refer to ME449 as T for Tear. Other sources (e.g., Danish newspaper Ringkøbing Amts Dagblad on 16 September 1977) use the WWI alphabet reference of T for Tommy for ME449. And possibly the crew of PM-T did refer to the aircraft as Tommy. In correspondence from ME449 pilot Stan Slater to Gail Michener in 2011, Stan commented that usage of “the phonetic alphabet . . . varied by individual crews until the 1950s”.